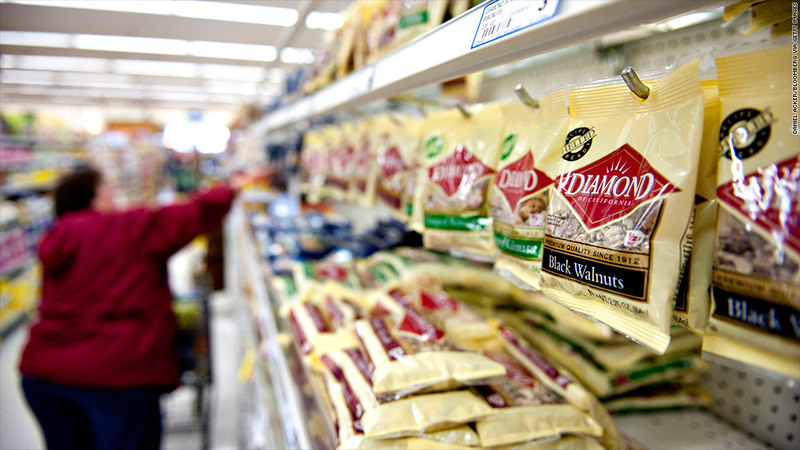 A woman shops near a display of Diamond Foods Inc. Diamond brand nuts in a supermarket in Princeton, Ill.
Nut seller Diamond Foods is shelling out $5 million after being accused of some unsavory accounting practices. The Securities and Exchange Commission said Thursday that the company and its former CEO have settled charges related to an allegedly fraudulent accounting scheme used to boost earnings results. Diamond's former chief financial officer has also been charged, and is fighting the case against him. In addition to Diamond's $5 million settlement, former CEO Michael Mendes has agreed to pay $125,000, after voluntarily forfeiting $4 million in compensation when the fiasco came to light. The SEC's case is still pending against former Diamond chief financial officer Steven Neil, with the trial not yet scheduled. Mendes and Neil were replaced in 2012 after the company revealed its accounting problems. Diamond's (DMND) brands include Diamond of California nuts, Pop Secret popcorn and Kettle Brand chips. In 2012, the company was forced to restate its earnings for the previous two fiscal years after revealing it had misreported the prices it paid to acquire walnuts. The news left investors feeling salty -- Diamond's stock subsequently sank to $17, down from a high of $90 in 2011. The SEC says that as walnut prices spiked in 2010, Neil delayed the recording of payments to growers, instructing his finance team to disguise portions of the fees as advances on future crop deliveries. Mendes was accused of negligence -- the SEC says he should have known the walnut costs were reported inaccurately when he certified the company's financial statements. "Diamond Foods misled investors on Main Street to believe that the company was consistently beating earnings estimates on Wall Street," said Jina Choi, director of the SEC's San Francisco regional office. "Corporate officers cannot manipulate fiscal numbers to create a false impression of consistent earnings growth." Michael Shepard, a lawyer for Neil, countered that "just because there was a restatement doesn't mean there was a villain." Neil "followed long-standing company processes, and an accounting treatment approved by the company's outside auditors," Shepard said. "He looks forward to prevailing at trial." Diamond did not respond to a request for comment. Sara Brody, a lawyer for Mendes, said he "is pleased to have resolved this matter."